Bridgeport, CT - While interviewing for her new position as Chief Operating Officer, Sabrina E. Smeltz doesn’t recall being asked about her willingness to rappel 18 stories down a building for Wakeman. But alas, the Club’s newest fundraiser – Over the Edge presented by People’s United Bank – is set for this Sunday, September 16, when 72 supporters will rappel 18 stories down People’s United Bank Corporate Headquarters. Sabrina will celebrate one month on the job by rappelling the downtown Bridgeport landmark as part of the pre-event VIP celebration Saturday. Joining Sabrina for VIP rappelling are Bridgeport Mayor Joe Ganim, Bobby Valentine (Sacred Heart University), Father Tom Simisky (Fairfield Prep), Jason Li (WEBE 108/WICC), and Karen Galbo (People’s United Bank). The Sunday rappelling is open to the public, with festivities throughout the day in the sky, street, square and Harlan Haus. Back on the ground, Sabrina’s responsibilities as Chief Operating Officer include overseeing day to day operations, leadership of strategic planning, and implementation of new initiatives for the organization. Sabrina comes to the Club after a 16 year YMCA career, most recently serving the past 3 years as Branch Executive Director for the YMCA of Downtown Manchester, NH. Previously, she was the Associate Executive Director at the Greater Waterbury YMCA and started her YMCA career with the Northwestern CT YMCA in Torrington, CT.
Sabrina comes to the Club with experience in facility & program operations, board & staff development, fundraising, and building community partnerships in both urban and suburban communities. She earned a B.S. degree from Springfield College in Movement & Sports Studies with a concentration in Physical Education & Athletic Administration. 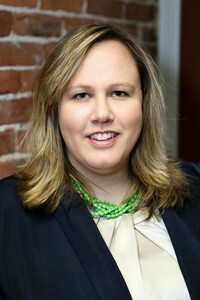 She served as a trainer for YMCA of the USA Leadership Program and on the Board of the YWCA of NH, and has extensive experience playing, coaching and officiating volleyball. For details about Over the Edge for Wakeman presented by People’s United Bank, visit www.OTEwakeman.com. Since 1913, Wakeman Boys & Girls Club has provided a safe place for youth and teens after school, evenings and weekends. Focused on Academics, Character & Leadership Development, and Healthy Lifestyles with nationally acclaimed programming, the Club continues its mission "to guide and inspire young people, especially those who need us most, to reach their full potential as productive, caring, and responsible citizens." Led by professional staff and volunteers, the organization serves nearly 3,600 youth annually through its Southport Clubhouse, Smilow-Burroughs Clubhouse in Bridgeport, and Outreach at McKinley School in Fairfield.